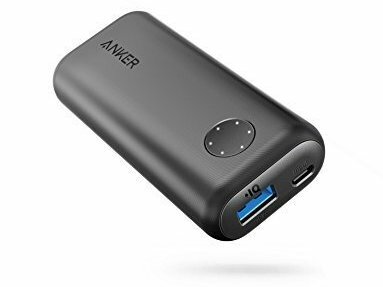 ﻿ If you’re looking for a power bank that you can carry everywhere and that charges your iPhone 6 at its fastest possible charging speed, Anker Powercore II 6700 has got your back. Powercore II 6700 is our pick as the best ultra-compact power bank available in the market for iPhone 6. It is impeccably built, weighs just 4.2 oz (120 gram), is conveniently small, which makes it easier to carry along and have ready battery backup on hand wherever you go. Powercore II 6700 is available in two colours, black and white, with the white being a bit more expensive. The narrow design looks good and makes this powerbank fit in your pockets easily, or slip effortlessly in your handbag. Powercore II 6700 will fully charge (zero to 100%) an iPhone 6 two times. Powercore II 6700 charges iPhone 6/7/8 twice! Aukey 10000 18-watt USB-C PD is our favourite USB-C PD portable charger for iPhone 6. USB-C PD is now the preferred charging standard for Apple’s all-new upcoming iPhones and almost all new Android phones. USB-C PD power banks are hence a future-proof investment. Aukey 10000 USB-C PD is a sleek, compact power bank with USB Power Delivery output. It is the a future-ready portable charger available in the market as it also fast-charges (zero to 50% in 30 minutes) the latest iPhone XR, XS, X, 8, 8+ etc. The power bank also offers the convenience of getting charged with a Lightning cable, meaning that you do not have to carry a separate cable. 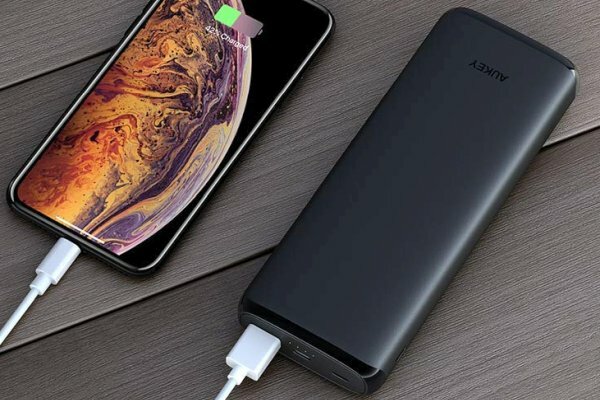 This power bank can fast-charge latest iPhones, such as iPhone XS/XR/X,8/8 Plus, from zero to 50% in just 30 minutes. Aukey 10000 18-watt USB-C PD will be fully charged in 3.5 hours with any 18-watt USB-C PD wall charger. Weighing about 8 oz (230 grams), Aukey 10000 PD is 1 inch thick. Besides all the latest iPhones, Aukey 10000 18-watt USB-C PD portable charger also fast charges all popular Android smartphones including latest Samsung smartphones (S10/S9/S8/S7/Note 9/8) and all Android phones supporting Quickcharge 3.0. Full Quickcharge 3.0 output support fast charges Android phones such as Samsung S10/S9, LG G8/G7 etc. 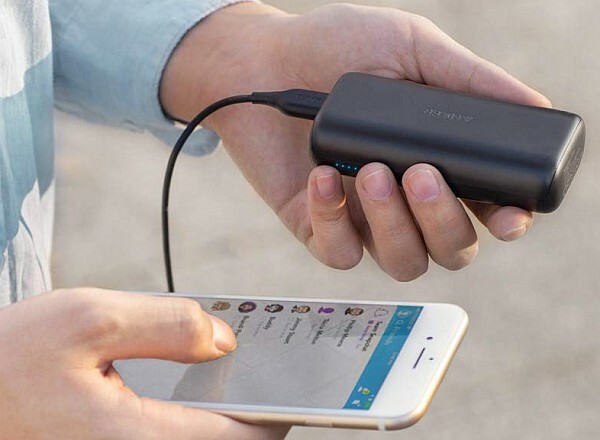 Anker PowerCore 10000 Redux is the latest plain-vanilla compact power bank in the market by Anker. It has a capacity of 10000 mAh and is the best compact portable charger for your iPhone 6. It can fully charge an iPhone 6 almost four times and gives a charging speed of zero to 50% in about 40 minutes for the iPhone 6. Anker PowerCore 10000 Redux is user-friendly with a 10-point LED battery status indicator. PowerCore 10000 Redux supports maximum charging speed of 2.4 amps, which translates to zero to 50% in 40 minutes. It is safe to say that PowerCore 10000 Redux is the most well-built non-PD compact Anker power bank in 10000 mAh category. It comes in a new rectangular design with dimensions of 4 inches x 2 inches x 1 inch and has a longish shape that is easy to grip. PowerCore 10000 Redux is a great investment for all the older iPhones such as iPhone 6/6s/7/7 Plus, SE due to its compact size and support for fastest possible charging speed for the iPhone 6. Aukey 20000 PD is a sleek USB-C PD power bank with 20000 mAh of battery capacity that will fast- charge both latest iPhones and Android phones as it supports both 18-watt USB-C PD and Quickcharge 3.0. 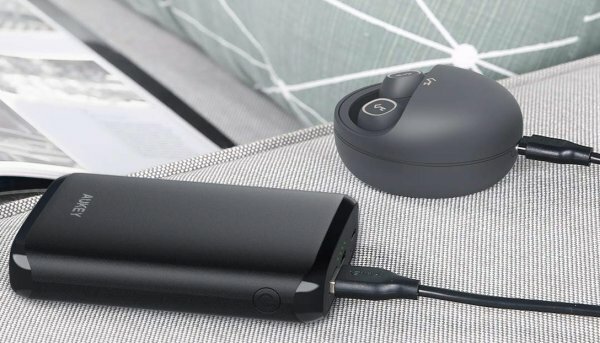 Aukey 20000 PD can be charged in three ways – with a Lightning cable, a micro-USB cable, and also with a USB-C cable. It takes about 3.5 hours to be fully charged with a USB-C PD charger. It weighs 14 oz (390 grams) and Quickcharge 3.0 port charges compatible devices up to four times faster than conventional charging. The portable charger also has a low current charging mode for devices such as fitness trackers and wireless headphones. Aukey 20000 PD also has built-in safety features to protect your devices against excessive current, overcharging or overheating. In case you are planning to upgrade your iPhone, the Aukey 20000 PD‘s USB Power Delivery port will fast-charge latest iPhones such as iPhone X/XS/XR/8 etc. And not only iPhones but it will also fast-charge latest Android phones like Google Pixel 3 XL and other compatible USB-C devices. Aukey 20000 PD will charge most phones zero to 50 % in just 30 minutes. It can charge your iPhone 6 almost 7 times! Supports both 18-watt USB-C Power Delivery and 18-watt Quickcharge 3.0. Charges PD compatible phones 4 times faster than conventional standard charging.